Having raced against New Zealand’s best three-year-olds of the 2015-16 season, Ali Baba (pictured) makes his long-awaited return in the Rating 65 event over 1200m at Ellerslie tomorrow and will have the services of apprentice jockey Ryan Elliott. “He had a good long break after what was a solid three-year-old campaign, so it will be rather exciting to see what he can do as an older horse,” co-trainer Pam Gerard said. The son of Savabeel has drawn a touch wide for his first up run this campaign, although has shown previously what a devastating turn of foot he possesses. Onto Avondale on Wednesday and the team will present three runners including the promising Avec Moi who looks close to a win following a gallant runner-up effort last start on her home track at Matamata. The daughter of Pour Moi will be ridden by Craig Grylls and will line up in the maiden three-year-old event over 1400m. “She’s a nice style of filly that will just continue to improve with further racing and eventually more distance,” Gerard said. “She possesses good speed, which is a great assist of hers, and just seems to put herself there which will take her a long way. The second runner on the card is the talented Soul Sista who doesn’t always quite get the rub of the green, although has finally drawn a gate this preparation and looks as though she will get a needed firm track. To be ridden by Craig Grylls, Soul Sista takes her place in the Rating 70 event over 1600m and with luck in the running could give this field a decent shake. The third and final runner is second starter Henley Road who will be looking to produce an improved effort on her last performance and will have the services of senior jockey Danielle Johnson. “She didn’t have much luck getting caught three-wide last start, and we were expecting her to blow out a little bit at finish,” Gerard said. 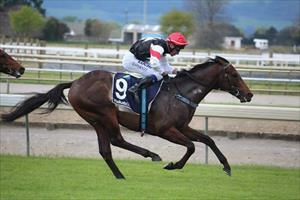 Henley Road lines up in the maiden three-year-old fillies race over 1200m.